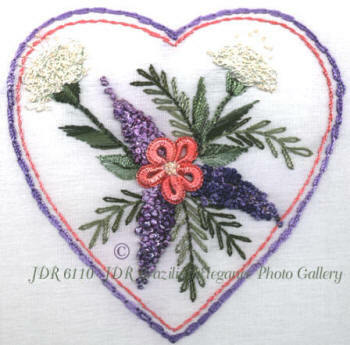 "Heart Full of Lilacs and Ferns"
A stitch review is provided for the following stitches. If you have the basic knowledge of Lazy Daisy, blanket stitches, bullions, French knots, stem stitches and alternating satin stitch, very simple detached buttonhole stitch, turkey stitches and chain stitches this design will be very easy. You’ll find this plant in fields, meadows, and along roadsides. If you find milkweed, you’re also likely to find monarch butterflies. Meadows of Milkweed plants attract hundreds of monarch butterflies. Milkweed is essential for the existence of Monarch butterflies. You may want to stitch a butterfly sitting on your flower tops. Where does the milkweed plant get its name? It leaks a thick, white sap when cut or broken that makes it look like it’s leaking milk. It grows from 2-6 feet high. It usually has a single, simple stem. 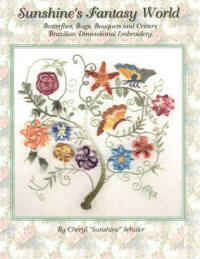 Flowers: Blooms from late June to August. Flowers emerge in umbrella-like clusters and range in color from pink to rose-purple to orange or white. Fruit: in the fall, flowers develop into seedpods. The pods have a warty outer skin filled with downy fluff that will carry the seeds on the wind like a parachute. Pioneers used sap from milkweed as a cure for warts. The airborne fluffy parachute of the seed was used by Native Americans to insulate moccasins. The dried empty seedpods were used as Christmas tree decorations by early pioneers.